There are plenty of exciting activities within walking distance and beach equipment vendors galore! Come play in Kihei and stay at the popular Kihei Kai Nani. We are located right across the street from famous Kamaole Beach Park II. Try paddle boarding, whale watch, or work on your tan at this beautiful Maui beach. Kihei Kai Nani is also just a short drive to luxury shopping in nearby Wailea as well as spectacular golf and tennis facilities. 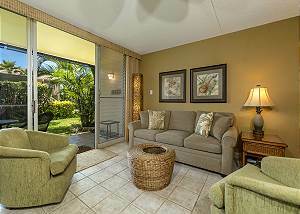 Complementing the great location of these popular Hawaii vacation rentals is our fantastic property. Consisting of 13 low-rise 2 and 3 story buildings and 180 condominium units, you'll enjoy the six acres of lush tropical gardens including gently swaying palms, fragrant plumeria and banana trees as well as wide variety of tropical flowers like the hibiscus. 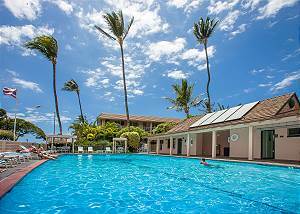 Not to mention, this hotel resort features one of the largest swimming pools in Kihei. Let our cozy and comfortable units be your tropical haven. With fully equipped kitchens and warm furnishings you will want to make Kihei Kai Nani your Hawaiian vacation home-base every year! Our large 60ft swimming pool invites you to lay back on a lounge and enjoy that new book after a refreshing dip. Your private Lanai will be your favorite new hangout. You will love dining outdoors with the tropical breezes coming through. Take a walk on the picture perfect beach across the street and dip your toes in the soft sand with the Pacific rushing towards you. Prepare to make memories that will last forever on this perfect Hawaii vacation for everyone! Whether you are a single traveler or a family, Kihei Kai Nani's location and property features are sure to astound and help you make the most of your vacation. Stay with us at Kihei Kai Nani for barbecues in paradise, relaxed affordable vacation rentals, and plenty of fun in the sun!